Influx of unskilled workers is putting pressure on China's 'stick soldiers'. Peng Yining reports from Chongqing. With a startup cost of just 10 yuan ($1.4), joining the ranks of Chongqing's "stick soldiers" is possibly the cheapest business opportunity there is. The long hours and low pay also make it one of the toughest. In the mountains of Southwest China, where the unforgiving terrain can often make transport difficult, "stick soldiers" - migrant laborers hired to carry heavy goods - still provide a vital service in this densely populated city. Carrying just a sturdy bamboo stick and a coil of thick green plastic, Gui Laiyun wanders the streets every day from dusk until dawn looking for work. "Getting started is easy," said the 52-year-old. "Five yuan for the stick, five yuan for the cord." Customers hire Gui to carry anything from furniture and huge bags of rice to electrical appliances like refrigerators. Each time, he firmly attaches the cargo to his stick using the green cord and then balances it on his right shoulder as he tramps along streets, down alleyways and up stairs. 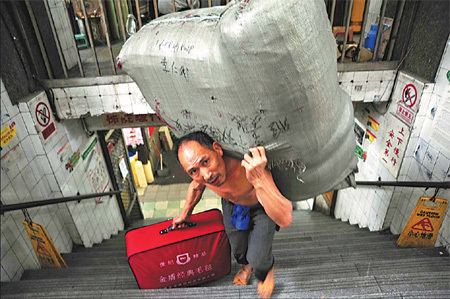 "I charge between 2 and 10 yuan, depending on the distance I carry the goods," he told China Daily. "On a good day I can earn almost 100 yuan." However, good days are hard to come by lately, especially as more people flock to the city from surrounding villages. Most of them have little education, making manual work their only option. More than 32 million people live in Chongqing, a busy river port city on the Yangtze River. About 7 million workers from the countryside already live in urban areas, and according to a 2007 report by the city government, their numbers will continue to increase dramatically, with estimates that the rural population could be halved to 10 million within the next decade. The influx of unskilled labor is expected to put extra pressure on a unique profession that has proved invaluable since the city's port opened in the late 1800s. At least 30,000 stick soldiers ply their trade on the streets of Chongqing. Locals call them bang bang jun, which literally means "the stick army", and hail them as they would a taxi, by simply waving their hands and shouting "bang bang". Ages range from 18 to 74 but research shows the average for a stick soldier is about 50 years old, while the vast majority did not even receive a middle school education. Although most are men, women can also be spotted doing the job at farmers markets, where they are often hired to carry vegetables for elderly people. They charge much less than men, however. 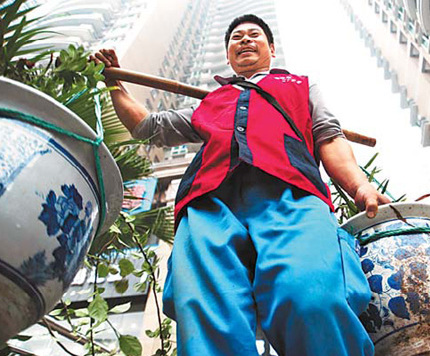 Dorm accommodation is the traditional home of Chongqing's stick soldiers. "Most bang bang don't like to be called migrant workers," said Chen Zixi, who is in his third year at Chongqing University and leads a student community care society and has studied stick soldiers for three years. "Migrant workers usually work for factories, learn skills and earn relatively stable incomes," he said. "These soldiers work for themselves; there is no organization or insurance. There may be many of them here but they all work alone." As part of his research on stick soldiers, Chen and his team interviewed and followed about 250 workers to find out how they live. Today, the student society offers free lectures on vocational advice to stick soldiers and has also found several of them jobs or professional training with city-based companies. "If they aren't taught professional skills to get stable jobs, when they get too old to carry heavy loads they will have no option but to head back to the countryside with no insurance or medical care," said Chen. 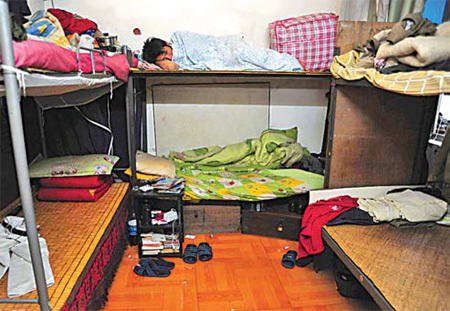 Like most rural workers in big cities, Gui Laiyun sleeps in a basic 80-square-meter apartment, which he shares with about 50 other men. The beds here are made from wooden boards and rusty scaffolding. Rent is just 1.5 yuan a day. Stick soldiers often wait for customers outside supermarkets and shopping malls. Each morning, at about 6:30 am, the soldiers disperse to begin their daily march along the streets of Chongqing. Finding work is no easy task, and according to Chen Zixi's research, about seven to eight hours of a worker's 12-hour day is spent idle. Some chat or play poker on the side of the street to pass the time, while others will attempt to increase their chances by standing outside supermarkets and shopping malls. Either way, competition for business is fierce, and anyone who shouts "bang bang" is immediately surrounded by laborers all trying to offer their best price. "Whoever hires us, we call them 'boss'," explained Gui, who sports a blue jacket that is badly worn on the right shoulder. "We just have to be careful not to damage any of the goods. If we do, we will receive no payment and we'll have to pay them compensation." Stick soldiers return to their apartments only after the sun has gone down. The lucky ones shuffle back, visibly aching from a day of heavy lifting. The unlucky ones return empty handed. When Gui arrives home his room, is filled with the smell of the fried vegetables and rice cooked by the landlord (each meal costs the workers 1 to 3 yuan extra). But as more of his colleagues return, the odor of sweat permeates the air. There is little talking during the evening, only occasional laughter when one of the men cracks a joke or drops a bowl. "We live here to save money, not make friends," said Chen Liangcai, 56, as he chewed his food next to a man washing his feed in a basin of muddy water. "I don't need to know anyone here. I will move anywhere I can to make money." Chen Liangcai swapped life in his native Quxian county in Chongqing's remote countryside for the city after his wife died 20 years ago. He has worked as a stick soldier ever since. "I didn't finish elementary school, so it was impossible for me to find any other work," he said. "I have two children to support." As Chongqing becomes more urban, and with more roads being built, more people are relying on their cars and public transport, meaning less work for stick soldiers. Research suggested the situation is only going to get worse, with the municipality expected to be 70 percent urbanized by 2020, according to the 2007 city government report. "More bang bang come flooding in but the work is drying up," said Gui, who explained that he even once met an unemployed graduate working as a stick soldier. "He didn't know where to get a stick, so I told him how to buy one and how to tie the cargo up with rope," he laughed, before coldly adding: "But young people learn faster and work better than (older generations)." Gui is now considering returning to his village "but I don't think I can feed my family with farming", he said. Professional removal companies are also stealing customers. "Clients trust companies like us more," said Liu Xiaoxiao, who runs a moving service in the city. 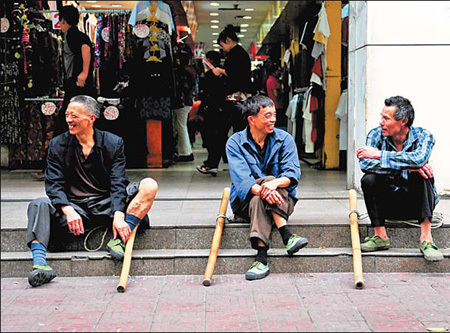 Liu, 47, was working as a stick soldier when he founded his company in 1997 with three colleagues using 20,000 yuan they borrowed from friends and relatives. The group even called it Bang Bang Jun. The business now employs more than 60 staff, all former stick soldiers, who are paid regular salaries of up to 1,500 yuan. Bang Bang Jun is expected to make 3 million yuan in revenue this year. "As an individual, life as a bang bang is very hard. I used to sleep on the street," said Liu. "They should be organized and trained." Bang Bang Jun offers its employees free meals and accommodation, and provides training. Also, Liu insists his staff call their customers "clients", not "boss". "People will only respect bang bang when the transportation industry (in Chongqing) becomes more serious and professional," he told China Daily. "This is the only way to ensure they can live in the city, instead of being sent back to the countryside when they are old and useless." However, Liu said that about 90 percent of stick soldiers are unwilling to work for his company, even though it would guarantee them a regular income. Although the number of removal companies is rapidly increasing in the city, stick soldiers make up just 1 percent of the workers being hired by them, said the businessman. "I don't want to pay taxes and be ruled by a company," said 42-year-old Wang as he waited for work in downtown Chongqing. "Being a bang bang means being free. I keep every penny I make and can take a rest whenever I want." Liu Zeping, another stick soldier stood nearby, agreed and said he needs to go back home during harvest season and feels a company would not give him the time off. Wang also said he does not mind the prospect of returning to the countryside when he gets too old to work. "The city is a good place to make money but I don't want to live here at all. City people look down on (rural people)," said the villager.